My Salah Mat is an interactive educational prayer mat for Muslim children to teach them how to pray. I was taught how to pray by my grandmother since I was lucky to grow up living in the same house as her. Times have now changed and children learn through various interactive ways. The parents and family members still remain the principle teachers, but tools definitely help. Here is our My Salah Mat review. Be sure to read till the end for a contest to win the mat also! The My Salah Mat is designed for children age 3 – 10. It comes with detailed instructions on how to use the mat for different age groups according to the developmental stages of the children. The mat is touch-sensitive and requires batteries for usage. Once you start the mat it guides the child through the various stages of prayer such as wuzu, qibla, azaan, iqama, neeyat, takbir, rakaat etc. The mat is designed in such a way that younger children can interact with the mat to get exposed to the various steps in namaz including listening to the various ayats and surahs. They will also learn the proper postures. As the children grow, their attention levels increase and they can be guided through the enter steps of namaz. The prayer mat can be used in seven languages including Urdu and English! So you can choose the language your child is comfortable in. My Salah Mat comes with a manual, guide for parents and an activity book for children. 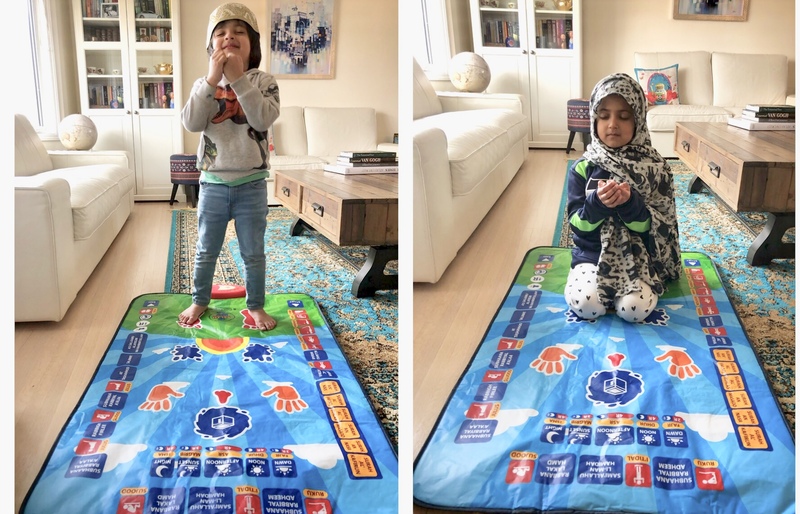 I feel My Salah Mat is the perfect gift for young children for them to get interested in daily prayers in age-appropriate ways and highly recommend it. You can buy the mat on MySalahMat.com and also check the site for more details. They shop worldwide! You can win a My Salah Mat for your children or to give as a gift! We hope you enjoyed our My Salah Mat review. Do enter the contest! Its an excellent way of instilling muslim values in todays gadget controlled era. An innovative and modern interactive way to motivate kids for salah. Thank you for introducing me to this mat…I love it that it has sounds now a days kids are so technology addicted and learn so much through videos and sounds …and for more younger kids like 4-5 years old ones the colors will be fascinating too as my kids are particularly drawn towards bright colors. I love this! What a great way to get kids involved in prayer. I need this! A very fun way to help children motivate to pray at very young age of even 2 -3 years old. This is amazing ..love it.. This is such a good initiative.my 18th months baby girl is so interested in salah that I have to give her a Janamaz and sajdagah. And she tries to copy each and every step. This is the great idea to teach our kids how to pray in the right way…hope to win this for my two son In sha Allah. Thank you Tamania… I really like this Salah Mat. It’s very useful for teaching kids. Awesome idea! Would be so interesting for kids! I love this idea!!! It would be great for kids to get interested in learning how to pray! What a great initiative to introduce prayers in kids without difficulties.. excellent creation ny my salat mat .. thank you tamania for introducing us about this mat .. Awesome!…wish to have it for my 4 year old daughter.. Very nice idea and they’ll be learning different duas just while playing with it aswell. Hoping to win this for my 3 kids. Really hoping to win this msg for my children. They will love it! Wow! Really hope to win this for my children. They will love it! Love this salahmat. My son just started the namaz and this will be perfect for him. Assalamualaikum….. It would be nice gift for kids.it will involve kids nicely towards their big responsibility. What a great idea, Mashallah. I’ve been racking my brain trying to think of ways to teach my daughter to do Salah. My daughter just started namaz it would be so helpful for her an amazing way to teach our children. A very nice thing to teach kids salah! Thank you for introducing me to my Salah mat.My kids are very excited to win the competition. Such a lovely, innovative way to teach kids how to pray! ❤ Children these days are into latest electronic gadgets and what more could one ask for than something so interactive making them go near their religion!! It’s one of the best inventions of modern technology, I would say. Thanks for the review. I am looking into buying it now. It’s amazing thing for kids . Who ever wins this will be sadqa jariya for you @urdumom. I seriously love the concept of this matter so much. I would love to get this for all of my nephews and nieces. What a perfect gift idea 😍 This is sadaqa e jariah for yourself. Imagine Everytime a child will pray, you will get the reward as well because you played an integeral part in helping them learn salah and more importantly, falling in love with salah. Oh what a beautiful gift that is!!!! But am sure with this amazing salah mat she will enjoy it alot more.